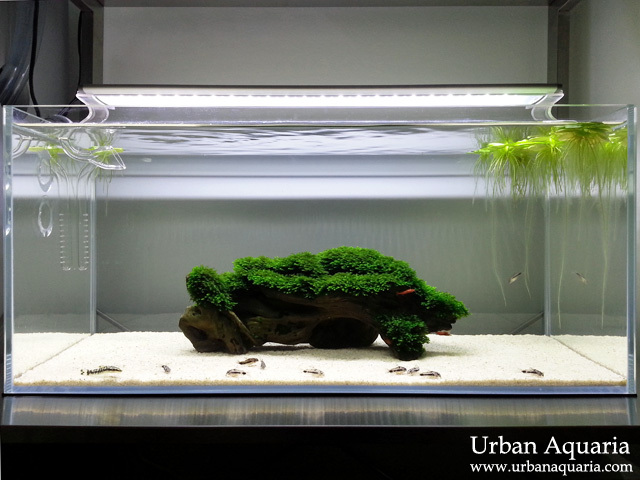 As this tank has a wide and low design, i choose to stock it with corydoras fishes since they spend most of their time on the substrate scavenging for food, hence the larger "floor area" will be ideal for their natural feeding behavior. I choose Sudo Reef Sand as its is fine grained, as well as a light beige color which still looks natural, but yet not too glaring. I narrowed my corydoras species selection down to the smallest "dwarf" variants... namely Corydoras Pygmaeus, Corydoras Hastatus & Corydoras Habrosus. 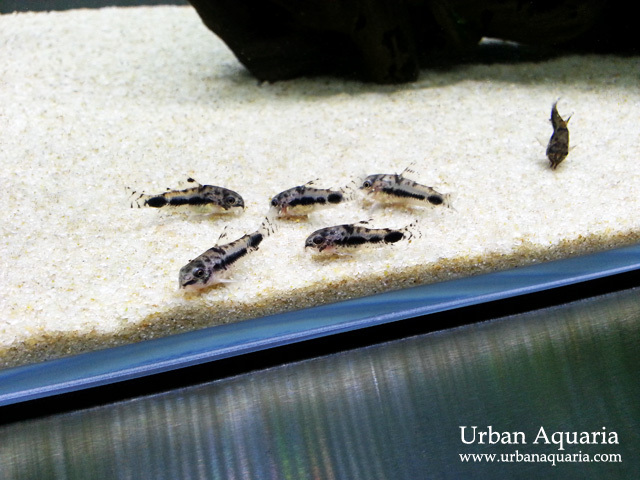 After reading up and observing the 3 species of dwarf corydoras at aquarium stores, i decided to go for Corydoras Habrosus. This is because out of the 3 species, Corydoras Habrosus seem to be the most out-going and least shy (they never hide and are moving around the tank all day). 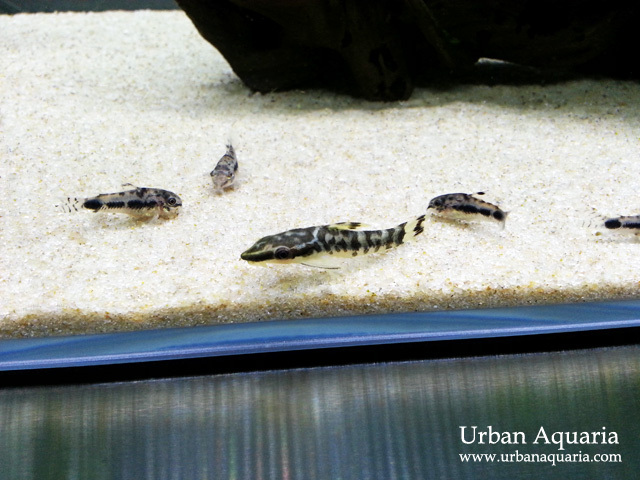 In addition, they stay at the bottom of the tank and scavenge around the majority of the time, just like the larger corydoras species. Those of you with sharp eyes would have also noticed a much larger catfish in the tank too. Thats right... its an Otocinclus Cocama (aka Zebra Oto). I got it from a friend a few weeks ago who recently de-commissioned one of his tanks and needed a new home for this fish, so i offered to adopt it. Interestingly this particular adult otocinclus has been raised on commercial food and fresh vegetables from young, so it doesn't seem to be interested in algae... i kept it in quarantine for a few weeks in my shrimp-only tank which has lots of green and brown algae to choose from but it only went for the shrimp's food and vegetables. It also spends most of its time rooting around on the substrate too... this particular oto seems to act more like a cory! I figure it could have been so accustomed to prepared/commercial food that it doesn't bother with algae anymore. So i decided to shift it to this tank as the sand substrate is more suitable for its feeding habits and it would be more comfortable in the company of corys too. So far, it seems to fit in nicely and even shoal around with the small corys. Its like a gentle giant amongst the tiny denizens. my favourite cory. im going to setup my 20 gallon long tank dedicated to these cuties this summer. I'm glad to find your post and cant wait to see the updates. I bought mine from Clementi Florist & Aquarium (aka C328)... Corydoras Habrosus are quite common and usually stocked at most LFS regularly, i guess you'll just have to shop around to find them.